For the second year straight, Punkorama Radio has teamed up with Monster Energy and Toronto-based indie label Underground Operations to bring us the F-U! Awards. A celebration of "Frequently Underestimated" alternative Canadian talent, the ceremony is slated for February 5 and will be hosted by Punkorama's Barry Taylor and JD at the Sound Academy. 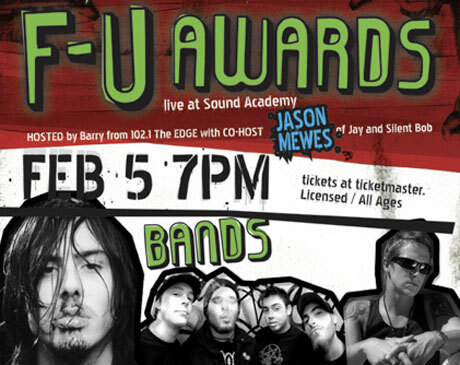 As a special treat this year, actor Jason Mewes (Jay from Jay and Silent Bob) will lend some credibility to the event, as will performers Andrew WK, the Flatliners, Die Mannequin, the Artist Life, Kingdoms and the Expos. A sort of mini-Warped Tour for the winter, the occasion also boasts professional skateboarding demos, a fan-vs.-hosts videogame competition, an Andrew WK and Jason Mewes look-alike contest and more. The Artist Life "The Last Time"
Living with Lions "Bottle of Charades"
To join the fray, pick up your tickets here.